A couple of recent blog posts over on Battle.net have highlighted some big changes coming to SC2’s out-of-game UI in Legacy of the Void. The one that has me actually excited like the pathetic fanboy I am is pictured above, changing how the campaign select screen works to be more akin to classic Brood War. There’s bigger changes on the social side of things, finally making chat a more useful experience for everyone involved. StarCraft II features on our best strategy games of all time list. Players have been asking for a more useful chat pane since Battle.net 2.0 first launched in 2010 and it looks like Blizzard have finally delivered it and managed to improve upon their 1998 designs. It’s more modifiable, accessible across multiple screens and saves more information to give to you when you’re free rather than expecting you to pay attention the whole time. Outside of that, 3D models (like on the campaign screen,look at the campaign screen, look at it, it’s so pretty) have been added to every menu screen to lag your machinefancy it up a bit. Room was made for this by moving most elements to the bar at the top of the screen. More details and comparison pictures in the official blog post. 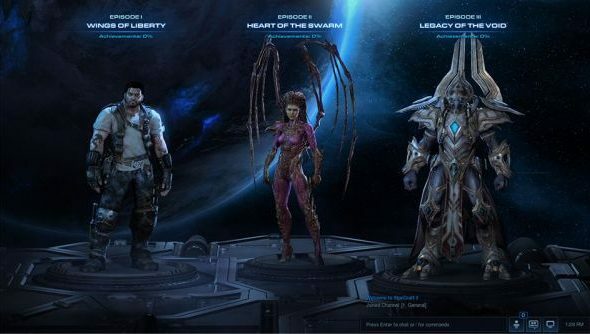 Blizzard also recently showed off everything that will be in the physical collector’s edition of Legacy of the Void. It’s everything you’ll expect if you’ve gotten Blizzard CEs before – artbook, behind the scenes DVD and soundtrack all in a nice box. It’s also got all the in-game goodies that come with the digital deluxe edition, natch.